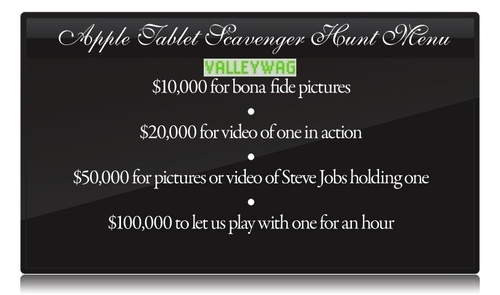 Is the Valleywag $100,000 Apple Tablet Bounty Legal? Now this is interesting. Valleywag announced that it is offering a bounty of up to $100,000 for information on the Apple tablet/iSlate/iTablet/ReallyBigiPhone device. TechCrunch (and others) pointed out that doing so might expose them to a tortious interference claim. It's certainly a colorable argument, and it wouldn't be the first time that a big company bullied a smaller one with that cause of action. It should be interesting to see how it plays out if Valleywag has any success with its campaign. Update: Well the cease-and-desist letter didn't take long.